I know that I may have exhausted your interest in toast and toast toppings with Tuesday’s post, but I’m hoping you’ll have the bandwidth for one more—especially since the recipe is good for more than bread alone. 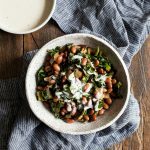 These herby, slow cooker tomato white beans can be served with noodles, over your favorite whole grain, with crackers, with steamed greens, and yes, they make for killer toast. It’s actually been a while since I used my slow cooker, but with final exams and end-of-semester papers approaching, not to mention some deadlines for my book manuscript, I’m anticipating a busy few weeks ahead. It’s a good time for big batches of food, and since I’m on this bread kick, I figured I’d prepare something that was good for scooping up with Ali’s peasant bread. 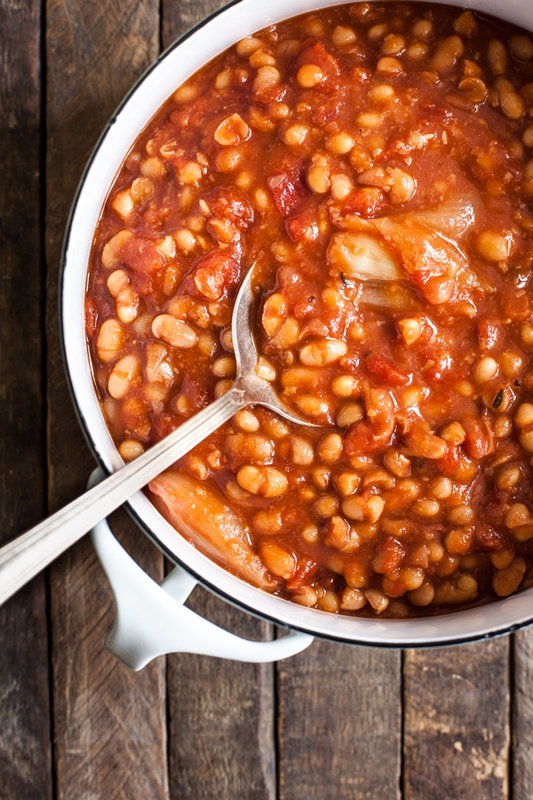 A big pot of soupy, saucy, fragrant legumes fit the bill. Funnily enough, after I prepared the recipe I saw that Ali has got a very similar one for gigante beans with pancetta on her blog, which was in turn inspired by one of Jenny Rosenstrach’s recipes. Friendly minds think alike, and now I’m eager to try this recipe template with gigante beans, which would probably remind me of my Yaya’s cooking (in fact, I don’t think I’ve had gigante beans since I was little). For now, this recipe is more Italian than Greek—I used thyme and rosemary sprigs, along with plenty of garlic—but you can take tons of liberty with the herbs and flavorings you use. I threw the beans in the slow cooker pretty late, after a long and tough day, so my tolerance for chopping was low. I peeled an onion, halved it, and threw it right into the pot, a la Marcella Hazan’s tomato sauce. I worried that the onion wouldn’t get tender or impart enough flavor, but of course eight hours was enough to tenderize it completely. In fact, I didn’t even remove the onion once the beans were done; I just smashed it a bit with a fork, to loosen up the pieces, then stirred it in. Same for the garlic cloves, which I dropped into the slow cooker whole. By the time the beans were finished, the cloves were practically melting into the beans and so very sweet; you can definitely leave them whole, and if you happen to see one on your toast, you can smash it a bit to unleash more of its flavor! Combine all ingredients except the pepper and oil in a slow cooker. Cook on low for 8-10 hours, until the beans are tender and the onion is practically melting. Remove the bundle of herbs and bay leaves. If you like, you can remove the onion (I just break mine into pieces and mix it in.) Taste the beans and add pepper and additional salt as desired. Stir in the olive oil, if using. Serve over toast, grains, steamed or sautéed greens, or pasta, with some vegan parmesan or hempesan on top. The beans can also be prepared by simmering in a Dutch oven, covered, over low heat, for about 2 hours, or until tender. Remove the onion halves, bay leaves, and herb bundle before serving. Leftovers will keep in an airtight container for up to 5 days in the fridge. They can be frozen for up to 6 weeks. 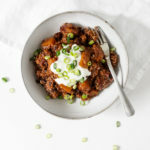 For me, the whole point of using a slow cooker is to conserve time and effort, so it’s especially nice when I can load it up with ingredients, set the timer, and fall asleep—no chopping or mincing or preliminary sautéing required. 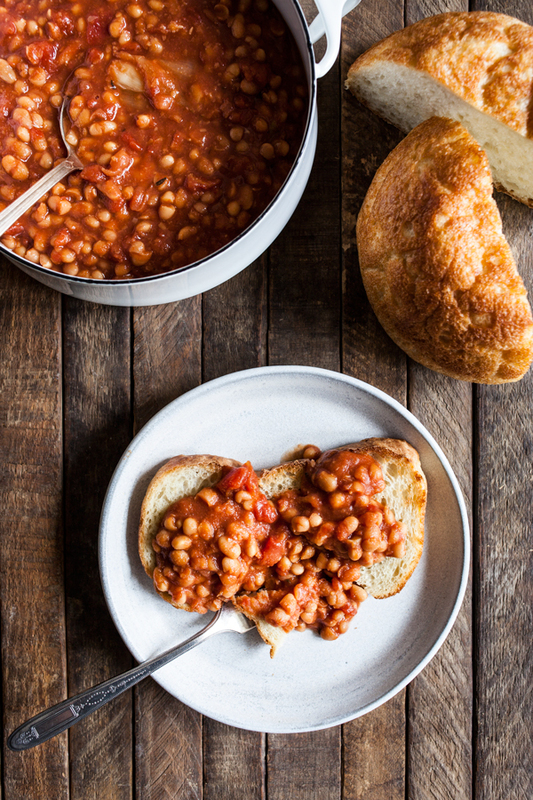 As for the beans, they’re just so good: garlicky, creamy, and packed with rich tomato flavor and umami. I love that they’re thick enough to hold their own with bread, but also soupy enough to work nicely with pasta. For the last few nights, I’ve boiled and drained pasta, then mixed it with a heaping cup of the beans and some cooked greens or asparagus. It’s a simple, almost-instant dinner that tastes homey and comforting. I’ve also tried scooping the beans over cooked couscous or bulgur, then pairing them with whatever veggies I’ve got. 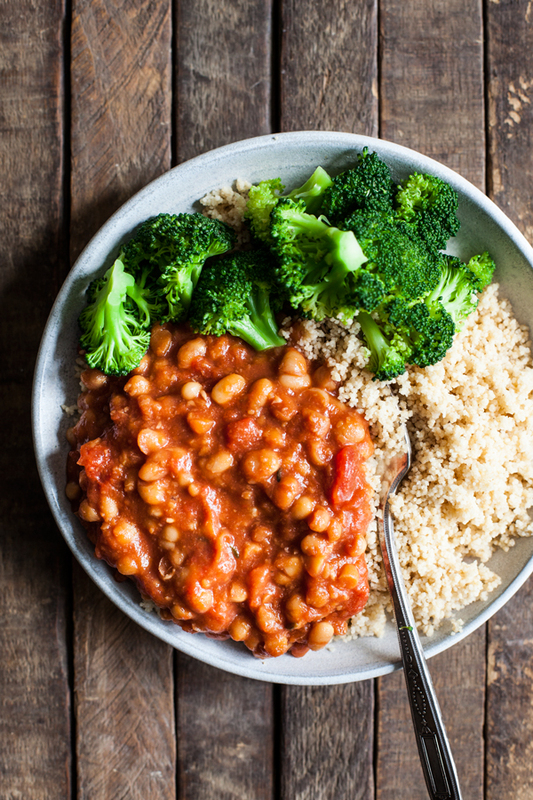 You could try this with quinoa, rice, barley, millet, or any whole grain you love. And once again, hempesan or vegan parmesan would be a great finishing touch. I’ve got a six quart slow cooker, which works best for sizable batches, but you could definitely cut the recipe in half if you’ve got a smaller slow cooker (or if you make it in a Dutch oven instead). Even now that I’m only cooking for one, I find it helpful to make big batches and freeze half right away. 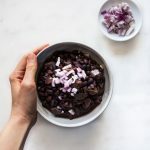 It’s such a relief to have ready-made, healthful food at the ready when I need it; just earlier this week I finished the last of my spicy black bean soup, and I was sorry to see it go. I can’t wait to try these! Oh, and I almost made gigante beans for Easter. But the grape leaves ended up being all that I could handle this year, lol. Looks delicious! I am always looking for slow cooker recipes, so thank you. I think this would be good over a baked potato too. Beans on toast! Brilliant. All home cooked. So, so yummy. The other great thing about a slow cooker is it doesn’t heat up the kitchen or house. Now that I’m back in the South, that is a welcome aspect. Thanks again for such a straightforward, simple and delicious recipe. Oh! This looks so good! I love beans. And tomatoes. And garlic! Thank you so much for this. 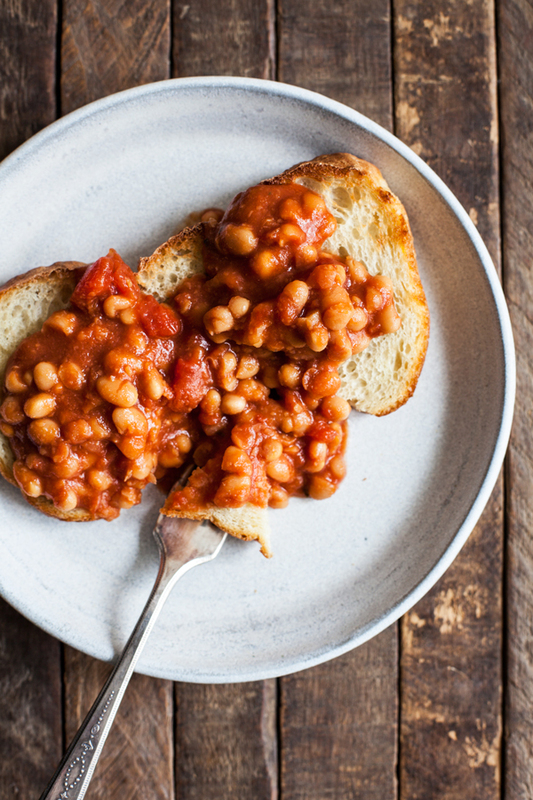 I have been looking for a recipe for healthy baked beans for ages. I like to use butter beans, as they have such a lovely fudgey texture, but find it hard to keep them whole as they always seem to disintegrate. Yum. It’s cold and rainy in the UK. This is definitely going in the weekly menu plan as seasonal comfort food. I wish I had a slow cooker, these look delicious! I know one of my aunts does so I’ll very politely ask if I can borrow it for a day. Maybe if I ask nicely enough she’ll just make this for me? 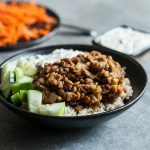 Not having to chop any veggies is a true slow cooker meal – I’m always a little grumpy about chopping and browning when the whole point is a lazy meal. 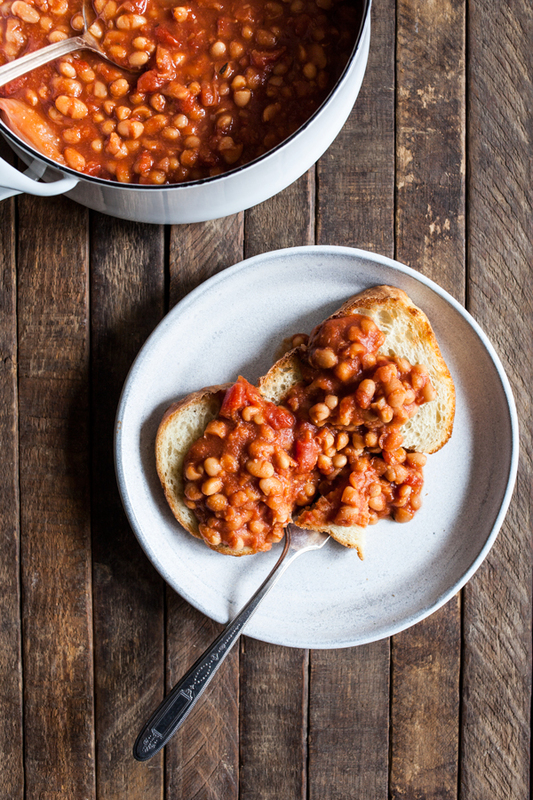 I think cooking beans is one of the best uses for a slow cooker. Did I not know you were Greek, too? My mother is 100% Greek. These looks so good, Gena! We love our slow cooker, in fact we’ve broken two in the past from over-using it! This sounds like a great, rustic, heart warmer! Thanks, Rich. I have this new-found appreciation for beans and I just can’t get enough of them. The convenience of this recipe makes is amazing. I know it will make an appearance in our menu this week. I thought these would be good for my lunches this week but it didn’t work out. They don’t taste great cold! I also had to cook my beans for 10 minutes in a pressure cooker to finished them. They were pretty tough, maybe they were old? All that being said, I used them as a pizza topping last night and that went really well. Probably I’ll have them as a hot breakfast on toast from now on instead of trying to eat them as a cold side. My Mum’s bringing her slow cooker over to my place next week. Can’t wait to try this! These were tasty but I ended up throwing them out. No amount of cooking would fully soften the beans. This sounds delicious! I was wondering if you measure the beans dry or after cooking? So if I was to use canned beans, would I use 2 1/4 cups of beans or is it 2 1/4 beans dry? TIA. Hi Cassie! It’s 1 lb (2.25 cups) dry. If I was to cook this in a Dutch oven instead, what would be the cooking time? Thanks! So long as you soak the beans overnight prior to cooking, I’d say 75-90 minutes (and check by tasting the beans, starting at 75 minutes). I like your dish. It looks healthy and nutrient meal. Tomato, beans and slow cooking are what I like.